These first words of one of the most praised and prayed songs in the Scriptures, Mary’s Magnificat, serve as the theme for a special three-day celebration June 25-27, 2012, in honor of Our Mother of Perpetual Help at St. Patrick’s Cathedral in New York City. Four Redemptorist missionaries will preach on themes of joy, confidence, love and witness, and how the Mother of God models those virtues. Mass will be celebrated daily at 5:30 p.m. with an additional Mass at 12 noon on June 27, the feast of Our Mother of Perpetual Help. Novena prayers and individual blessings with the icon will immediately follow these Masses in the Lady Chapel. “Our Mother of Perpetual Help is a vital part of Redemptorist ministries and preaching,” said Rev. Patrick Woods, former provincial superior and one of the Redemptorists participating in the celebration. “We introduce people to the icon’s story at every mission we preach and in every parish where we serve. For Redemptorists, Our Mother of Perpetual Help is a source of inspiration. When difficulties mount, we know her as a sure source of hope and strength. 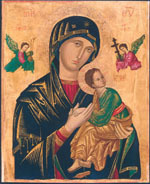 The Redemptorists have been promoting devotion to Mary under her title “Mother of Perpetual Help” since 1866 when the original copy of this miraculous icon was entrusted to them by Pope Pius IX with the command “to make her known.” Since then she has become one of the most recognizable images of Our Lady in the world. Novena celebrations surrounding the feast of Our Mother of Perpetual Help attract thousands of people annually to Redemptorist shrines in Baclaran, Parañaque City, Philippines and Limerick, Ireland. The feast day itself means packed churches in several other cities, including nearby Brooklyn, NY, where the Redemptorists’ Basilica of Our Lady of Perpetual Help in Sunset Park is filled with Haitian immigrants who come to celebrate the feast of their country’s patroness. The Redemptorists arrived in America on June 20, 1832, a little less than 100 years after St. Alphonsus Liguori began his spiritual family of missionary preachers. In 2012, the Redemptorists are blessed to celebrate 180 years of service on these shores. The first six Redemptorist missionaries landed in New York City and made their way to Cincinnati, OH, to serve the poor and isolated German immigrants. Over the next 30 years, the Redemptorists grew along with the country, gradually migrating to the cities to serve the needs of Irish and German Catholic immigrants. In 1870, the first icon of Our Mother of Perpetual Help arrived in Manhattan.